We are all geeks for one thing or another. Personally, I was, first and foremost a music geek. Well before I ever punched my first chit, I was blaring ridiculous and wonderful music from my walkman while I picked weeds for extra cash. At first I was limited to the cassettes my parents owned (see Billy Joel, Michael Jackson, Neil Diamond, Harry Connick Jr. et al). One day I was with a friend and his brother played a mix tape his girlfriend had given him. Typical fare from the time on the whole (fairly forgettable) but then a song like no other came on. My friend's brother quickly pushed the FF button, as he found the song annoying, but I remembered enough to find it on the archaic internet that then existed. "Particle Man" would be my entrance into a beautiful world of strange and wonderful music. With this list I will recount a bit of TMBG history, share some of my personal favorite TMBG bits 'n' pieces and hopefully, all those other TMBG fans out there will join in and add their falderal. All quotes from wiki will be in italics (no need for me to recap what has already been written). 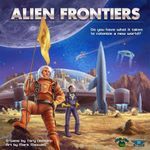 Sit back, enjoy and please join in as we delve into the sublime and startling world of They Must Be Giants! 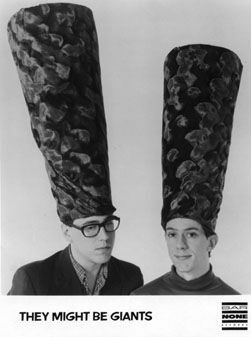 Linnell and Flansburgh first met as teenagers growing up in Lincoln, Massachusetts. They began writing songs together while attending Lincoln-Sudbury Regional High School but didn't form a band at that time. The two attended separate colleges after high school (Flansburgh attended Pratt Institute), and Linnell joined The Mundanes, a New Wave group from Rhode Island. The two reunited in 1981 after moving to Brooklyn (to the same apartment building on the same day) to continue their career. 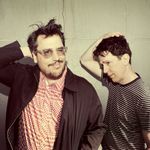 At their first concert, They Might Be Giants performed under the name El Grupo De Rock and Roll, because the show was a Sandinista rally in Central Park, and all of the audience members spoke Spanish. Soon discarding this title, the band assumed the name of a 1971 film They Might Be Giants (starring George C. Scott and Joanne Woodward), which is in turn taken from a Don Quixote passage about how Quixote mistook windmills for evil giants. According to Dave Wilson, in his book Rock Formations, the name They Might Be Giants had been used and subsequently discarded by a friend of the band who had a ventriloquism act. The name was then adopted by the band, who had been searching for a suitable name. 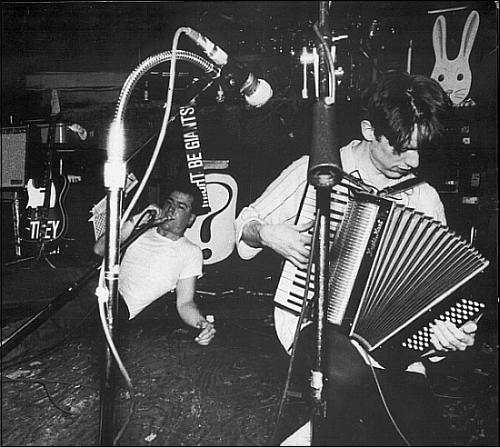 At one point, Linnell broke his wrist in a biking accident and Flansburgh's apartment was burgled, forcing them to take a break from performing. During this hiatus, they began recording their songs onto an answering machine, and then advertising the phone number in local newspapers such as The Village Voice, using the moniker "Dial-A-Song". They also released a demo cassette, which earned them a review in People magazine. 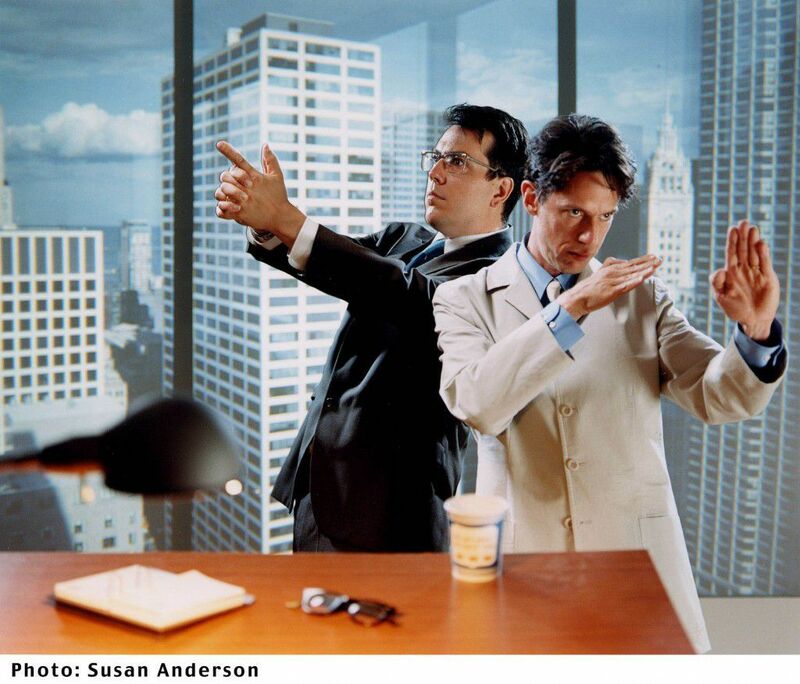 The review caught the attention of Bar/None Records, who signed They Might Be Giants to a recording deal. Dial-A-Song consisted of an answering machine with a tape of the band playing various songs. The machine played one track at a time, ranging from demos and uncompleted work to fake advertisements the band had created. Based in Brooklyn, NY, Dial-A-Song was often difficult to access due to the popularity of the service and the dubious quality of the machines used. In reference to this, one of Dial-A-Song's many slogans over the years was the tongue-in-cheek "Always Busy, Often Broken". The number (718)-387-6962, was a local Brooklyn number and was charged accordingly, but the band advertised it with the line: "Free when you call from work". At one point in 1988, the Dial-A-Song answering machine picked up a conversation between two people, who played the Dial-A-Song, then questioned how they made money out of it. An excerpt from the conversation has been included as a hidden track on the EP for (She Was A) Hotel Detective. 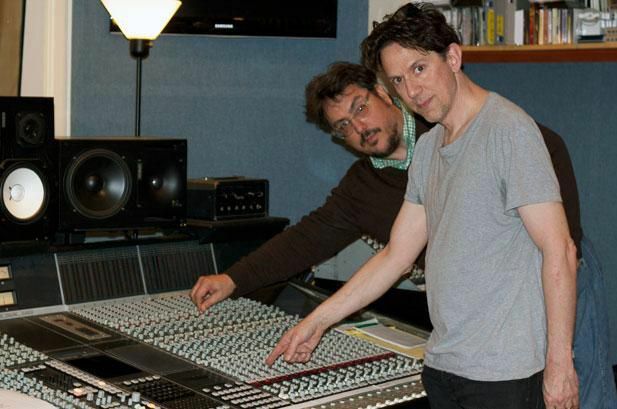 Longtime listeners to Dial-A-Song have counted at least 500 distinct songs and variations recorded by They Might Be Giants, making them one of the most prolific rock bands in history in terms of published material. A nice personal note: when I was 14 I would call this several times a week until I was reprimanded. I thought at the time that if I used the phone in my parents room, the call would be coded to them and not me. I remember the first time I called I heard the song "Ant". Brings me back. The much exalted premier album: They Might Be Giants! The duo released their self-titled debut album in 1986, which became a college radio hit. The video for "Don't Let's Start", filmed in the New York State Pavilion built for the 1964 New York World's Fair in Queens, became a hit on MTV in 1987, earning them a broader following. This one is simply classic to me, although my first listen came long after I'd heard "Flood". The number of classics on these early albums is just remarkable. This one is no exception. When you really realize how clever, funny and introspective the lyrics are (and certainly dark), you really can gain a great appreciation for the work they put into there youthful and almost childlike sound. In 1988, they released their second album, Lincoln, named after the duo's hometown. It featured the song "Ana Ng" which reached No. 11 on the US Modern Rock chart. In 1990, Throttle magazine interviewed They Might Be Giants and clarified the meaning of the song "Ana Ng": John Flansburgh said, "Ng is a Vietnamese name. The song is about someone who's thinking about a person on the exact opposite side of the world. 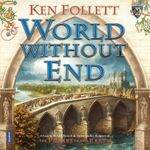 John looked at a globe and figured out that if Ana Ng is in Vietnam and the person is on the other side of the world, then it must be written by someone in Peru." Lincoln actually came much later for me - I could never find it on CD so I waited to buy Then: The Early Years to actually listen to it. Man, am I glad I found it - it still has some of the most vibrant, heartbreaking and beautiful songs of theirs. 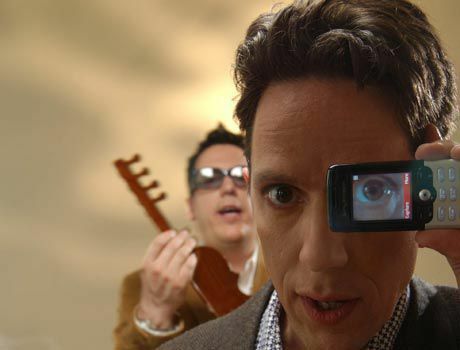 In 1989, They Might Be Giants signed with Elektra Records, and released their third album Flood the following year. Flood earned them a platinum album, largely thanks to the success of "Birdhouse in Your Soul" which reached number three on the US Modern Rock chart, as well as "Istanbul (Not Constantinople)". Flood was a game changer in my life. My brothers were popular kids in high school and I was borderline. I had friends from all walks of life but never really found a close group to bond to. When I heard Flood, my first venture into TMBG, I knew exactly what type of person I wanted to be: the type of person that finds this type of music fun and enlightening. This album informed my musical taste for years to come. As John said: "There's only one thing that I know how to do well and I've always been told that you only should do what you know how to do well and that's be you. Be what you're like. Be like yourself." In 1991, Bar/None Records released the B-sides compilation Miscellaneous T. The title referred to the section of the record store where TMBG releases were often found as well as to the overall eclectic nature of the tracks. Though consisting of previously released material (save for the "Purple Toupee" b-sides, which were not available publicly), it gave new fans a chance to hear the Johns' earlier non-album work without having to hunt down the individual EPs. Please pass the milk please: Apollo 18. In early 1992, They Might Be Giants released Apollo 18. The heavy space theme coincided with TMBG being named Musical Ambassadors for International Space Year. Singles from the album included "The Statue Got Me High", "I Palindrome I" and "The Guitar (The Lion Sleeps Tonight)". Apollo 18 was also notable for being one of the first albums to take advantage of the CD player's shuffle feature. 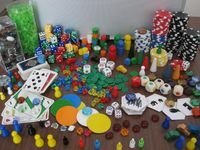 The song "Fingertips" actually comprised 21 separate tracks — short snippets that not only acted together to make the song, but that when played in random order would be interspersed between the album's full-length songs. Due to mastering errors, the UK and Australian versions of Apollo 18 contained "Fingertips" as one track. I have to admit, this one remains my favorite TMBG album. It was more mature musically and lyrically and I was also growing into maturity when it came into my life. Oh who am I kidding, it's just as goofy and fun as the rest of 'em, it's just that I for some reason took this one to heart. SPIDER: HE IS OUR HERO!!! Nothing smelling like a rose...JOHN HENRY!! John Henry was released in 1994. Influenced by their more conventional lineup, this album marked a departure from their previous releases with more of a guitar-heavy sound. It was released to mixed reviews amongst fans and critics alike. I'm disappointed by the above description - John Henry is an amazing album - I dare say it may be their last amazing album (the others are great but this is the last amazing). This was also about the time I started to listen to other music intensely. After John Henry I began to hear bands like the Pixies and Built to Spill and Pavement and I started to weave my way towards that hipster core but this one is still so vivid in my mind. Why do you suspiciously change the subject and break my concentration? FACTORY SHOWROOM AND SEVERE TIRE DAMAGE!! They left Elektra after the duo refused to do a publicity show, amongst other exposure-related disputes. In 1998, they released a mostly-live album Severe Tire Damage from which came the single "Doctor Worm", a studio recording. Around this same time period, Danny Weinkauf (bass) and Dan Miller (guitar) were recruited for their recording and touring band. Both had previously been members of the bands Lincoln and Candy Butchers (Previous opening acts for TMBG). Weinkauf and Miller have continued to work with the band to the present day. I mix these two in my mind because I heard them virtually together. one is live and one is a studio album obviously. I remember listening to FS on my walkman while I was getting ready to do my thang during Speech and Debate tournaments. There was a girl I had a crush on and listening to S-E-X-X-Y was just too much for this young man...but anyway...it's a terrific album but I'm afraid it's the beginning of the end of my devoted attention to the Johns. 1. I bought a metal detector because of that song. 3. The performance of Till My Head Falls Off below is from a short lived show on CC called Viva Variety (staring a wonderful batch of folks from The State like Thomas Lennon and Michael Ian Black). It was my favorite show in all the world and when they had TMBG on I was ECSTATIC! The show was cancelled shortly after. I will ever be looking for a magnetic Whaley Bar! "They call me Dr. Worm. But they call me Dr. Worm." It's not an insignificant amount of music for sure! I will leave you with a few great videos & pics and an invitation to touch on anything TMBG that I've missed - thanks for looking! Not that they were ever gone, but after focusing mostly on children's albums, homestar runner videos and b-sides, They might be giants proved to all of us that they could still rock our socks off in 2011 with The Else. This return to a rougher more energetic sound was more in line with what they had been doing at live shows for years and it was fantastic to see it reflected in their album work. Their latest album, The Nanobots continues in the trend of their thrilling career, of being both clever and knowing how to knock our socks off. It might be important to know what the pair are doing now. Now they make children's music for Disney. I adore Might Be Giants and now my two-year old does too.